Info sent by Sail GP press , official web sailgp.com. NEW YORK – One week after the league’s historic global launch, SailGP today announced the members of the United States SailGP Team, and revealed details of its two premier U.S. events, set to take place in San Francisco (May) and New York (June) of next year. 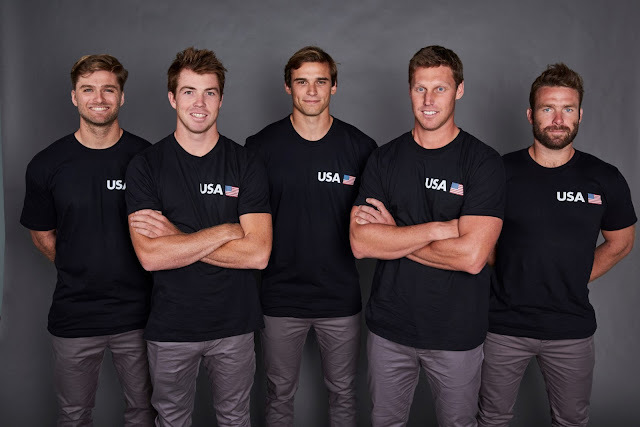 The five members of the U.S. SailGP Team are: Rome Kirby, 29, of Newport, Rhode Island (helmsman); Riley Gibbs, 22, of Long Beach, California (wing trimmer); Hans Henken, 26, of Coronado, California (flight controller); Mac Agnese, 24, of Fort Lauderdale, Florida (grinder); and Dan Morris, 30, of Newport, Rhode Island (grinder). The crew boasts an impressive track record in international racing, with a host of professional ocean racing and world championship honors between them. Kirby will be looking to add SailGP success to his 2013 America’s Cup win, while Morris has a World Match Racing Tour title under his belt. Agnese, Gibbs and former youth world champion Henken are all bidding to represent Team USA at the Olympic Games Tokyo 2020. Spearheaded by Larry Ellison and Coutts, SailGP will kick off its inaugural season in February 2019. It will feature five grand prix events and six national teams competing on identical wingsailed F50s – the world’s fastest, most technologically advanced catamarans. In addition to the United States, the six teams will represent Australia, China, France, Great Britain and Japan. Each team will have a five-person crew aboard 50-foot foiling catamarans, which are expected to break the 50-knot (or 60 mph) speed barrier. The intensely competitive, inshore racing events will be held in Sydney (February 15-16); San Francisco (May 4-5); New York (June 21-22); Cowes, UK (August 10-11); and Marseille, France (September 20-22). The SailGP event in New York will take place on the lower Hudson River, with the onshore Race Village located at Brookfield Place. It will feature Friday and Saturday afternoon racing just off the Battery and running north toward Rockefeller Park. In San Francisco, racing will take place in the San Francisco Bay, with the Race Village located on the Marina Yacht Club Peninsula. It will feature Saturday and Sunday mid-day racing on the city front racecourse. Sanctioned by World Sailing, each grand prix event will consist of two competition days with five fleet races, culminating in a final match race between the two leaders. The final race in Marseille will feature a winner-takes-all, $1 million championship match race between the season’s top two teams to conclude three days of racing.